Democratic Republic of Congo captain Robert Kidiaba says the 2015 Africa Cup of Nations may not be his international farewell despite reportedly saying it would be, before the tournament began. On Wednesday, DR Congo play Ivory Coast for a place in Sunday's final. Should Kidiaba, 39, contest Afcon in 2017, he would become the tournament's oldest ever player. "That has been my wish," he told BBC Sport. "There is a possibility I will stay on." He added: "I am not yet tired. I still have strength and what gives me strength is discipline. "When it comes to my job, I give deeply - I really respect my work." The veteran, who first played for the national team in 2002, is famous for his 'bottom-bouncing' celebration. The current record for the Nations Cup's oldest player belongs to the legendary Hossam Hassan, who was 39 years and five months when Egypt hosted and won the 2006 finals. Kidiaba, who has conceded four goals in four games in Equatorial Guinea, previously said he wanted to give a chance to other goalkeepers after well over a decade with the national team. "There are lots of goalkeepers in DR Congo to help and advise, and if I am by their side I hope I can give them confidence," he said. There is a feeling within the Congolese camp that Kidiaba still remains some distance above fellow squad members Nicaise Kudimbana and Parfait Mandanda, younger brother of Marseille goalkeeper Steve. However, he has no intention of stopping with his Congolese club, TP Mazembe, saying he has put no date on any potential retirement. 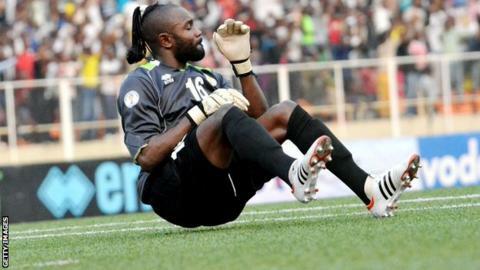 During his career, the pony-tailed goalkeeper has won two African Champions League titles, two African Super Cup, one African Nations Championship and seven Congolese league championships. In 2010, he also helped Mazembe reach the final of Fifa's Club World Cup, where they lost to Italy's Inter Milan. Despite his experience, Kidiaba will contest what will be his first Nations Cup semi-final on Wednesday in Bata. "I pray to God that we can reach the final," said Kidiaba, who can often be seen praying on the pitch. The Leopards are in the final four for the first time since 1998, and last reached the final when winning the title in 1974. They also won the competition in 1968.